The U.S. Defense Advanced Research Projects Agency (DARPA) has commissioned killer robots that can kill their targets without seeking any help from humans. However, some experts say the robots, called Lethal Autonomous Weapons Systems, can violate the Geneva Convention. 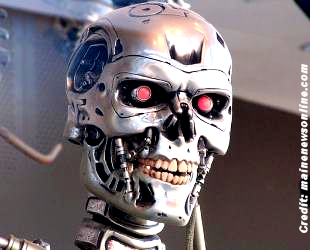 Stuart Russell, Professor of Computer Science at the University of California, Berkeley, wrote in Nature, an academic journal, that he believes that these robots can violate the Geneva Convention. "Despite the limits imposed by physics, one can expect platforms deployed in the millions, the agility and lethality of which will leave humans utterly defenseless. This is not a desirable future", he said. The United Nations last year agreed to what Russell suggested and called for a global ban on the devices, stating that the development could have 'terrifying' consequences. . . . The robots themselves most likely can violate the Geneva Conventions; however, DARPA commissioners who sanctioned these robots would be liable to prosecution for such violations. Robots have no sense of right and wrong; thus, they can't be held accountable; but their programmers do have this sense, and can be held accountable.